Sometimes I wonder why I created this blog. An outlet for my food obsession? To share the food I love with friends and family? A channel to share my resentment towards Martha Stewart? I guess it’s all of the above. I made a commitment to myself a long while back that if this blog begins to feel like work, causing me any angst, it would be time to call it quits. I used to feel that I had to post weekly, which quickly became bi-weekly… which started to give me shpilkes. I have to remind myself that no one has set a quota for me to meet. If for nothing else, it brings me personal joy and satisfaction to write and share a little something. Being so opinionated takes a lot of energy <insert cheesy smiley face here>. At this point I’ve decided how often I share something new is irrelevant to sharing something awesome. If it’s not delicious, I won’t share it. If I wouldn’t serve it to guests in my home, I won’t post it. I think cooking is not only an expression of creativity, but a way to feed the souls of the ones we love. I just had two of our South African relatives here for a short visit and they enjoyed this granola, so my theory seems to be working. 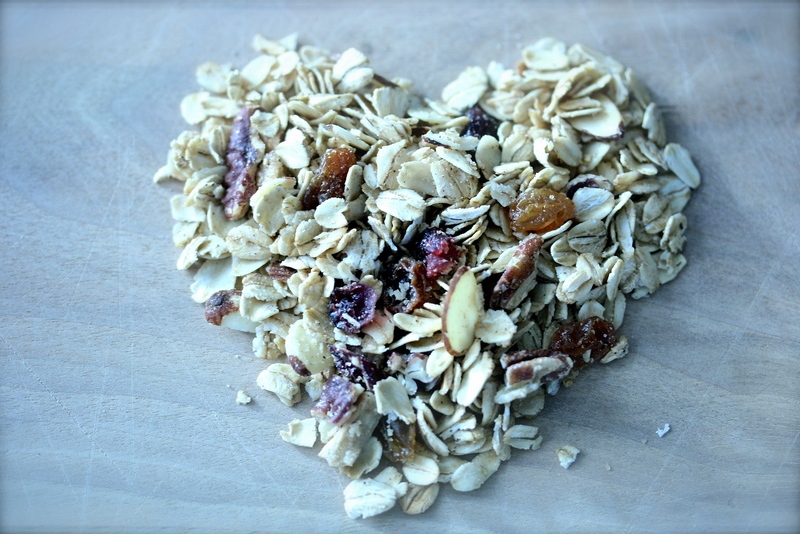 This simple granola recipe is the quintessential reason why I love sharing this blog. It’s so easy to make, there’s no reason not to give it a try. 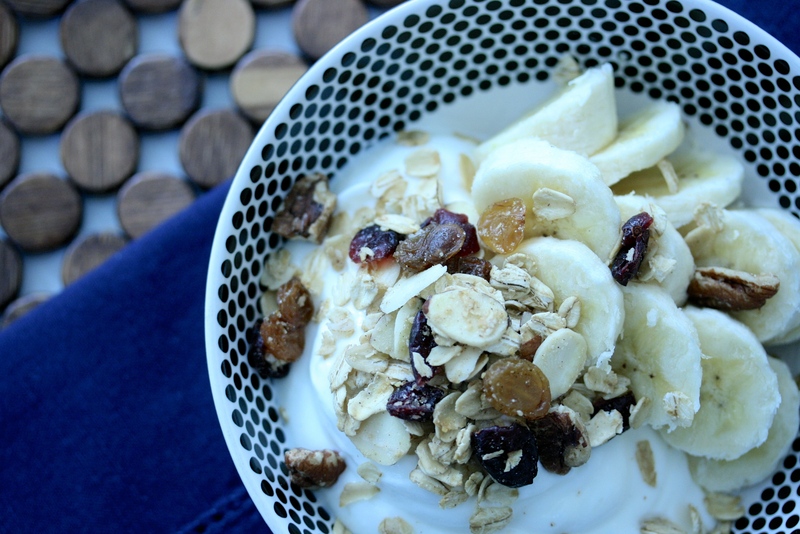 Granola and yogurt is a favorite breakfast here and though I’ve found store-bought granola that is lighter on the fat and sugar, I thought there must be a way to make it even better for us. Here’s what I came up with and it’s damn good! We’ve been eating it over plain Greek yogurt with a drizzle of honey and for dessert, sprinkled on vanilla frozen yogurt with a bit of real maple syrup (emphasis on the word real… not the artificial Log Cabin stuff). This recipe makes enough to store in a contain to pick at all week-long. 1. Preheat your oven to 325 degrees and line a sheet pan with parchment paper. 2. Combine all the ingredients in a large bowl. Using your hands, mix it together. The coconut oil, though initially solid, will soften as it warms from your hands. Make sure everything is evenly coated. 3. Pour the mixture onto your prepared sheet pan and bake in the preheated oven for 25-30 minutes, until it becomes golden, stirring occasionally. 4. Remove the sheet pan from the oven and set it on the counter to cool. Once cooled completely, pour into an air-tight container and store in your pantry. 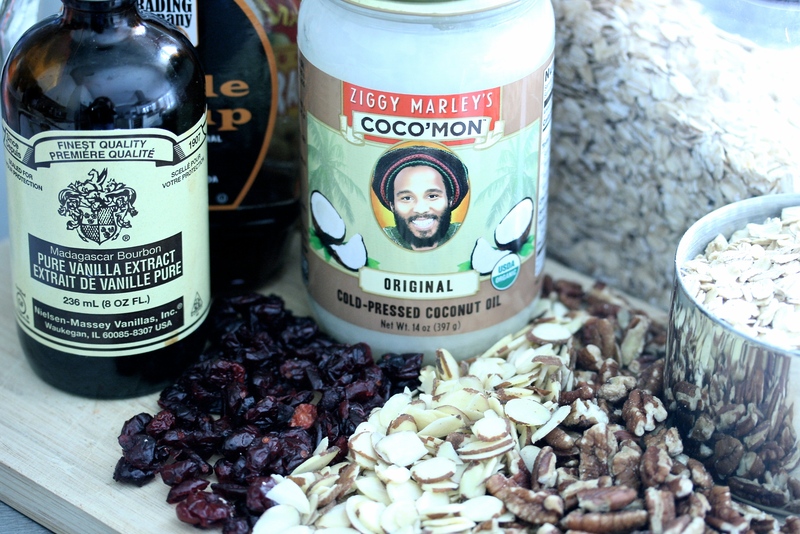 VARIATIONS… The great thing about this recipe is you can use any combination of dried fruit and nuts you like. I was thinking next time to try chopped dried apricots, pistachios and raisins or dried cherries and almonds. You really can’t mess this up. You can even add other spices. Nutmeg, cardamom and even a pinch of cloves. 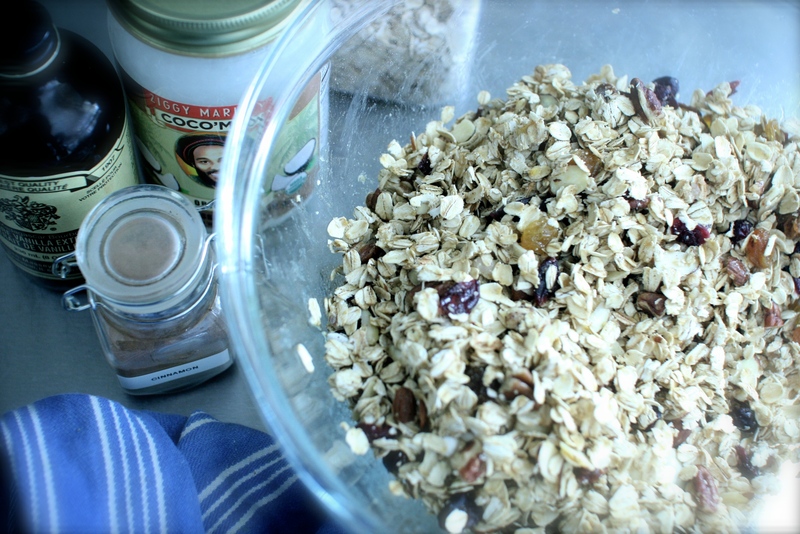 Mini chocolate chips would be a sweet addition, just add them after you bake the granola and it has cooled. 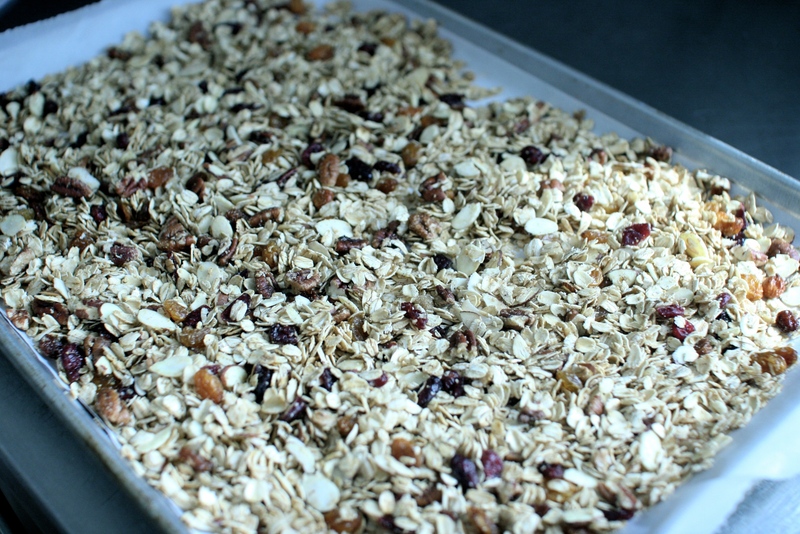 I’ve always wanted to make my own granola! nice’y done. It looks so good!